Police say they have made preliminary overtures to a non-profit and the Orange County Human Relations Commission. Despite ongoing protests that led to nine additional arrests over the weekend, Anaheim police said they are trying to start a dialogue with community groups to ease tensions over a spate of officer-involved shootings in the Orange County city. 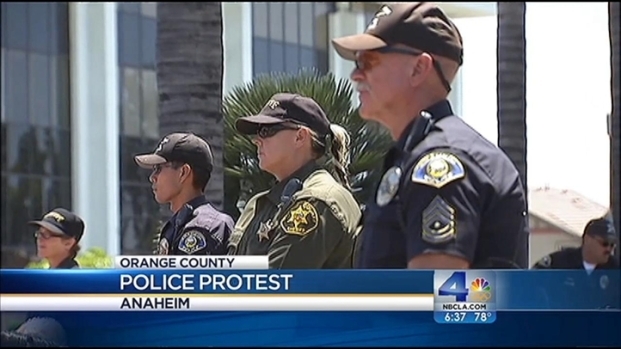 Law enforcement officials have made very early overtures to the non-profit group Community Service Programs, Inc., and the Orange County Human Relations Commission, Anaheim Police Department spokesman Bob Dunn told NBC4 on Monday. Police hope to be able to take those discussions further over the next couple of weeks as they seek to defuse community anger sparked by the deaths of Manuel Diaz, 25, and Joel Mathew Acevedo, 21, in separate incidents earlier this month. "We're looking to dialogue with the community," Dunn said. "We are 100 percent behind the process and we will wait for that process to take its course and then own whatever the results are," he added. It was not yet clear, he said, what form those discussions would take. For example, community members might want to talk about the incidents with a facilitator present but without police participation for the first few meetings, Dunn said. Anaheim police and protesters clash on Sunday, July 29, 2012 as tensions surrounding police shootings in the city intensify. Janet Kwak reports for the NBC4 News at 6:30 p.m. on July 29, 2012. Diaz, who was unarmed, was shot and killed July 21 as he fled on foot from Anaheim police officers. His mother, Genevieve Huizar, contended that officers first shot Diaz in the leg, and then, as he lay on the ground, shot him in the head. The next day, Acevedo was also shot and killed while fleeing Anaheim police. Officers later said In another incident last week, police fired at a burglary suspect, but he was unharmed. The lead agency investigating the shootings is the Orange County District Attorney’s office. Protesters as well as the City Council have called for federal and state law enforcement agencies to step in, but spokesmen for the FBI, the U.S. Attorney’s office and the State Office of Attorney General all say they have not yet opened formal investigation proceedings. Signatures from an online petition started by Washington-based Presente.org are headed to the hands of the California Attorney General. "It’s over 17,000 at this point," said Arturo Carmona. Still, officials at the FBI and the U.S. Attorney’s office say they are reviewing information on the case as they receive it from local prosecutors and others. And a representative of California Attorney General promised that the department would consider a petition asking the agency to open its own case. "The FBI will review evidence and reports by the Orange County District Attorney's Office to determine whether further federal review and/or investigation is warranted," spokeswoman Laura Eimiller said in a prepared statement. Protests over the shootings have rocked Anaheim for much of the past week. "First thing that comes out of their mouth after one of these is, they’re a gang member. They’re human, everybody’s human. We have a judicial system," said Anaheim resident Louisa Sanchez. Corie Cline, whose brother was shot by Anaheim Police, is part of the group "Anaheim Crusaders," which is planning weekly protests outside the Anaheim Police Department’s building. "They're getting away with murder," Cline said. On Sunday, seven adults and two youths were arrested after a protest near police headquarters grew raucous. At one point, demonstrators said they were going to march on Disneyland.